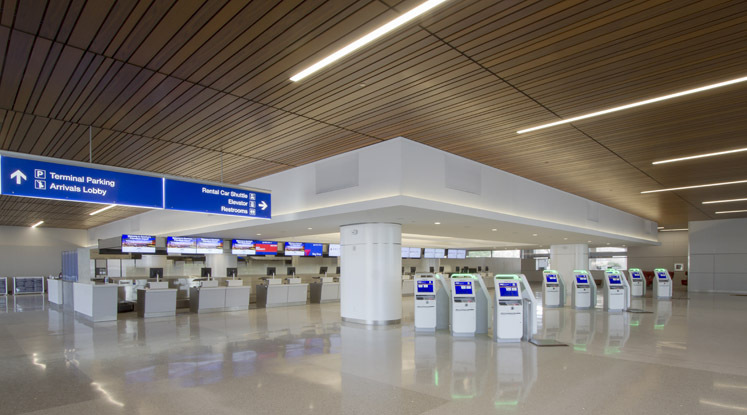 After 40 years of operation, Phoenix Sky Harbor International Airport Terminal 3 needed a facelift to provide today’s passengers with an improved, efficient, and intuitive travel experience. 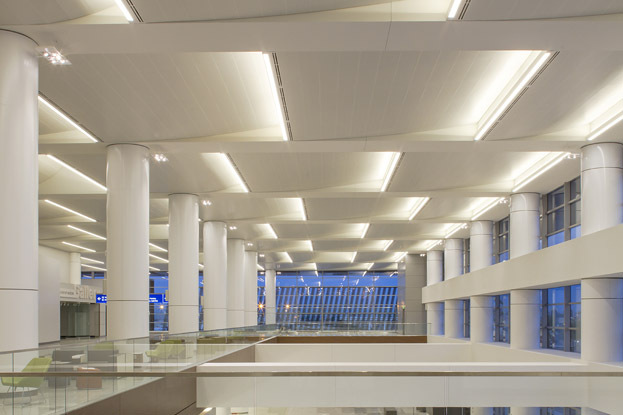 Hunter Douglas Architectural, alongside a talented group of architects, contractors, and installers, stepped up to the challenge of modernizing the busy transportation hub. 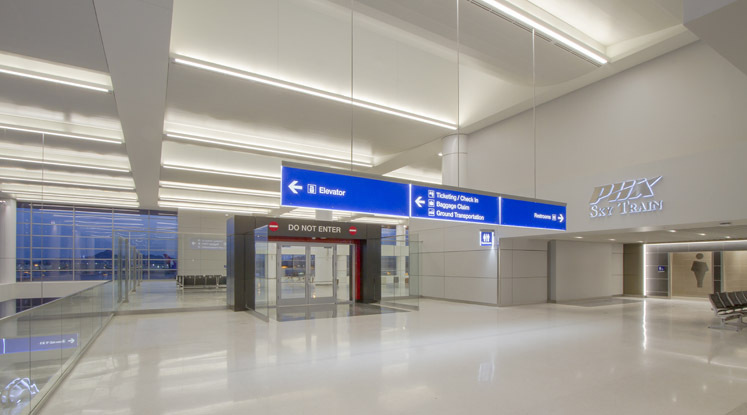 The video case study linked at right shows highlights of the challenging design and installation -- even more details are below. 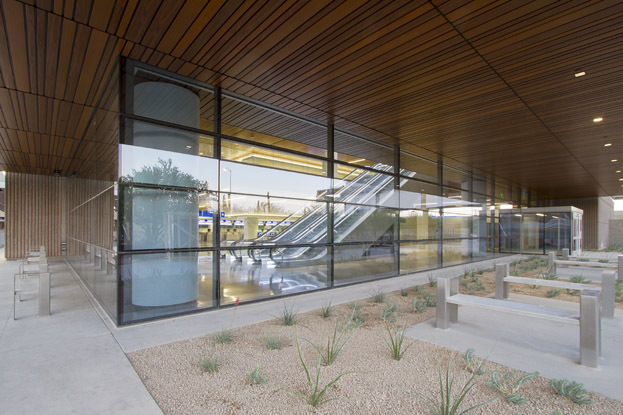 Approximately two years before construction began, the City of Phoenix, DWL Architects, Smith Groups JJR, Corgan Associates, HUNT, Austin Commercial, and Hunter Douglas began collaborating on design criteria. 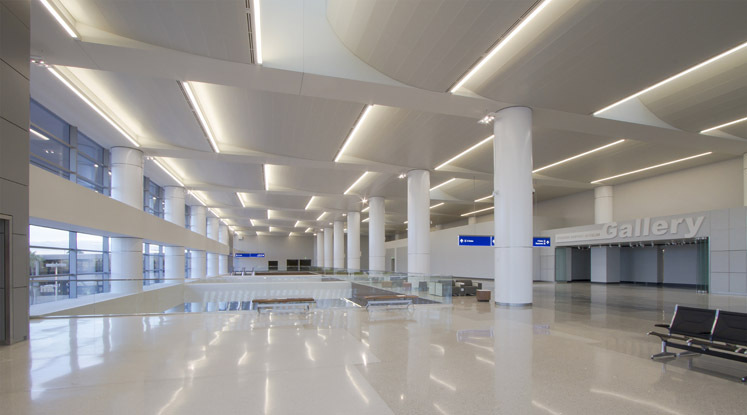 The $590 million dollar project would ultimately receive a Gold Award for Construction Excellence from the Ceilings and Interior Systems Construction Association in early 2017. 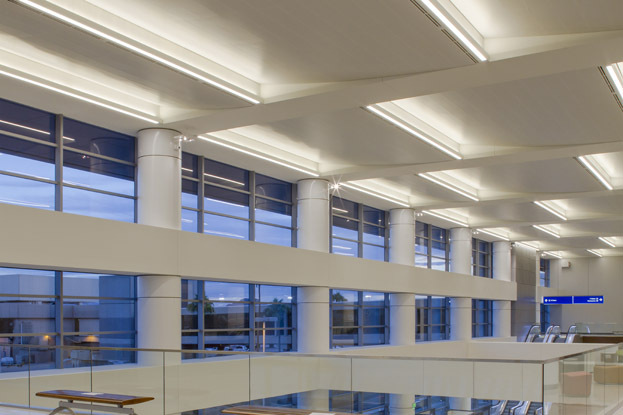 Style and performance standards for interior and exterior ceiling systems had greatly evolved from the original 1970s décor. 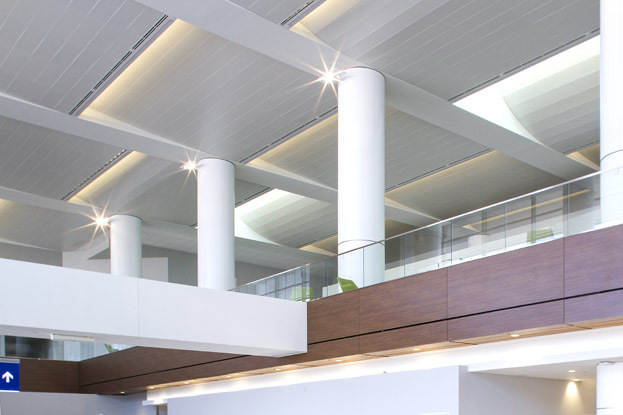 The darker, reds and browns of the original ceiling were exchanged for clean, white panels and natural, wood-look slats. 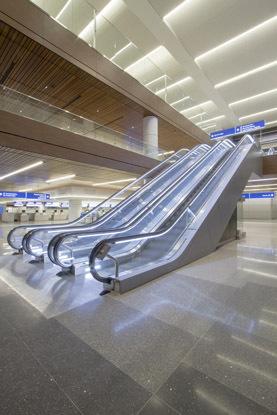 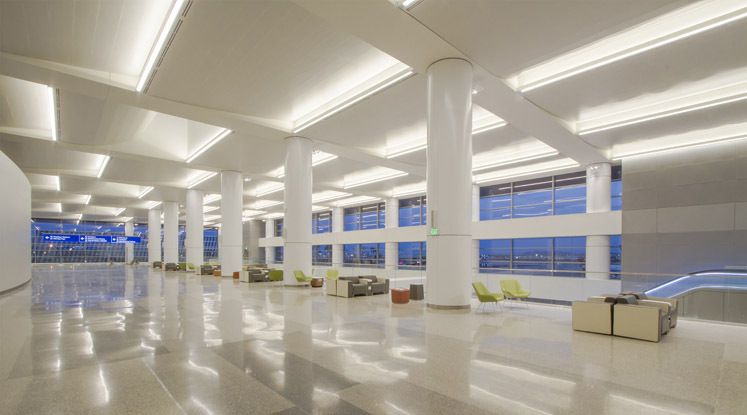 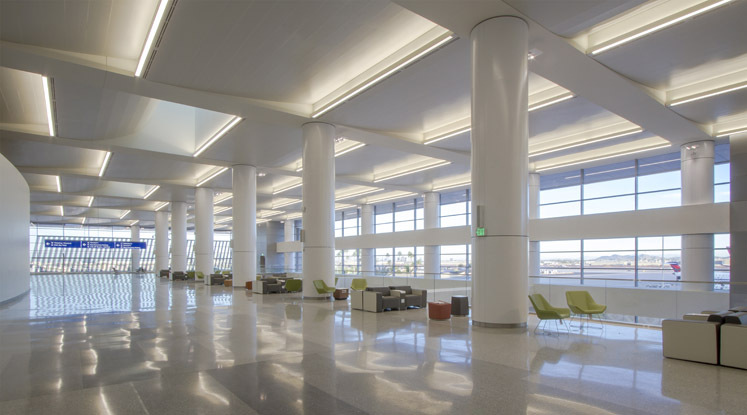 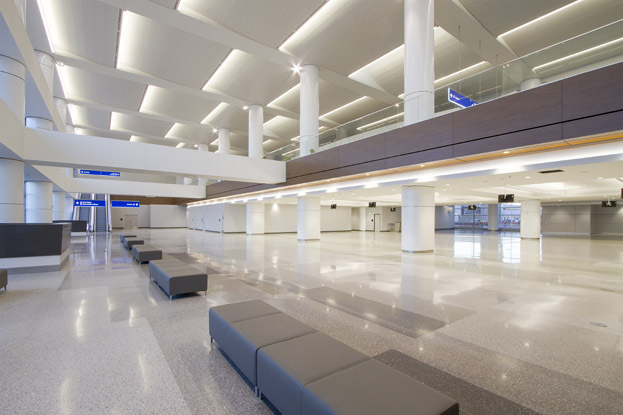 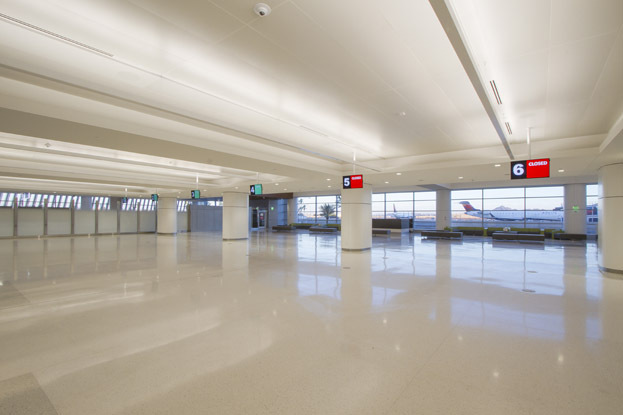 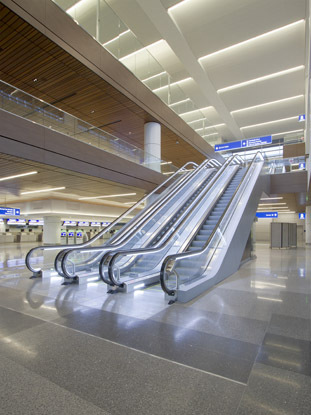 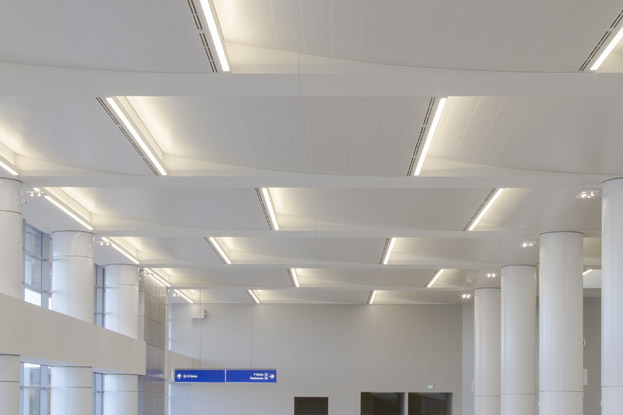 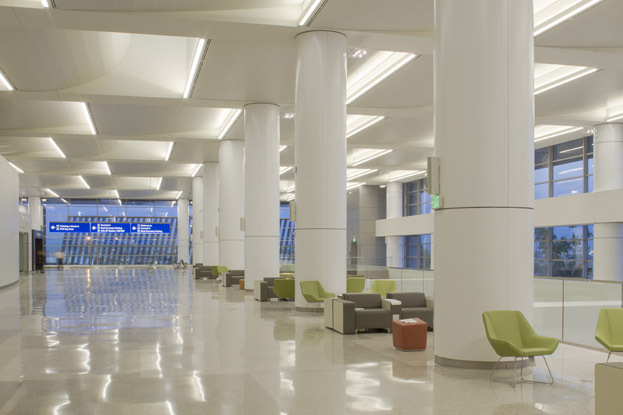 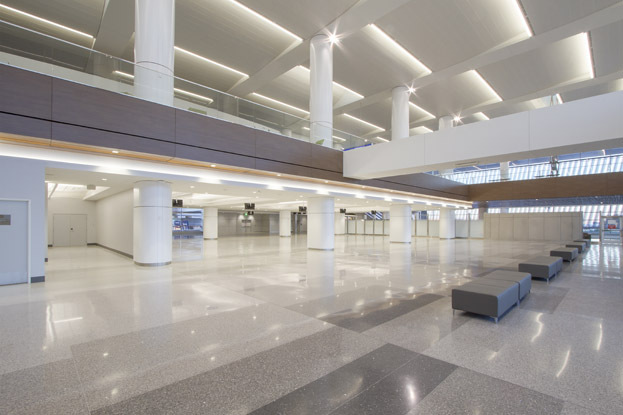 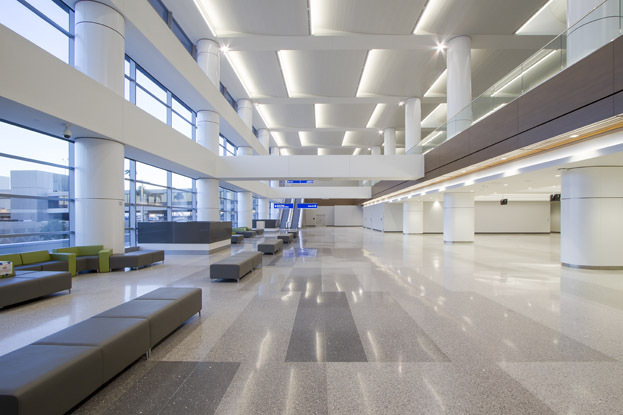 Hunter Douglas provided product solutions in the form of Torsion Spring, Segmented Torsion Spring and Metal Linear Multi-Box Continuous ceiling systems to aid the airport’s arrival to a new era. 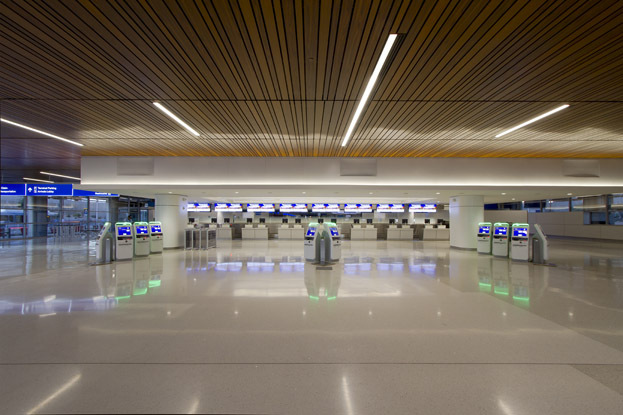 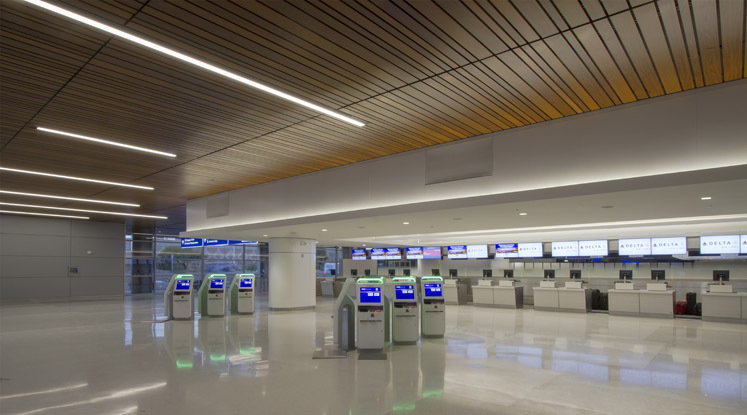 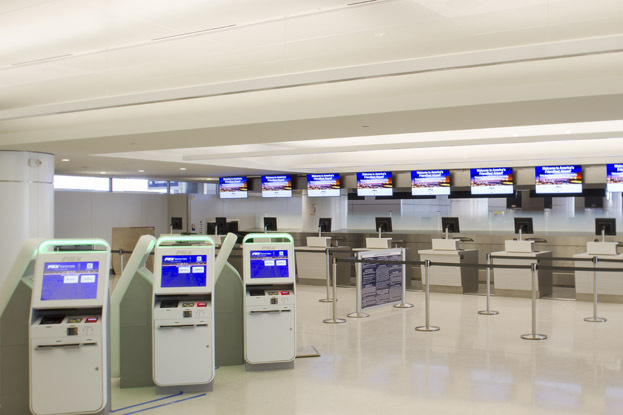 Metal Linear Multi-Box Continuous ceiling systems resembling individual wood slats were specified for lower levels along security checkpoints. 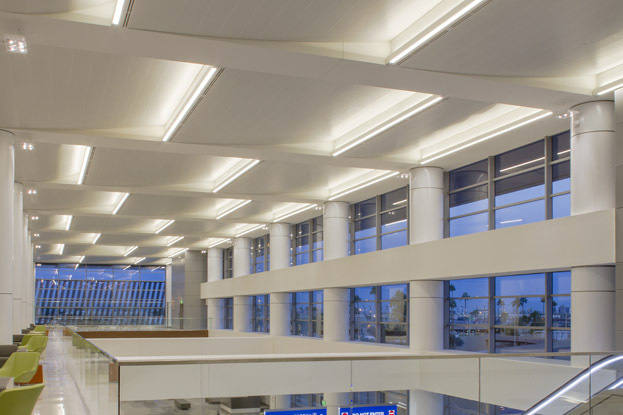 The linear system required precise design, planning, and installation due to its modular nature and randomized perpendicular lighting. 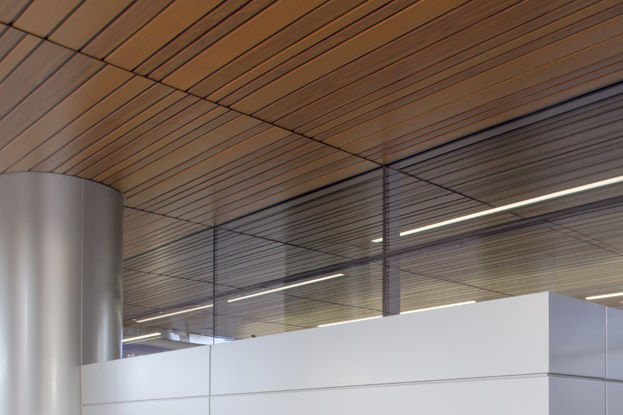 The ceiling plane had two different finishes, each cut into three different sizes. 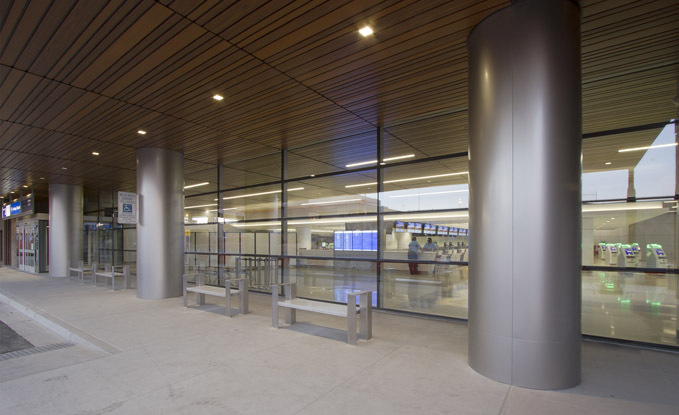 Each 10-foot panel comprised randomly assembled four-inch, six-inch, and eight-inch wood-look slats hung independently to align with flanking columns. 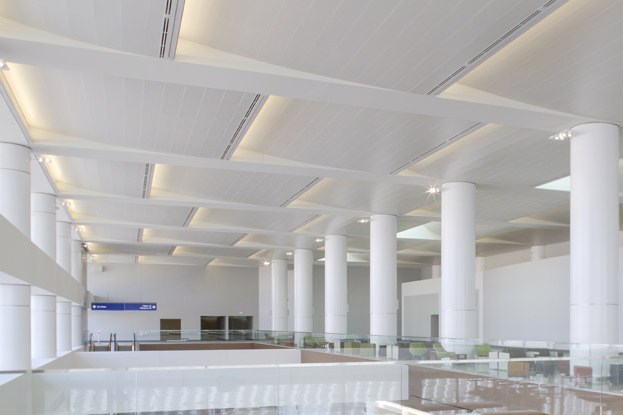 Multi-radius Torsion and Segmented Torsion Spring scalloped ceiling systems in a white finish were installed both flat and curved along the terminal’s upper floors to accommodate previously designed skylights. 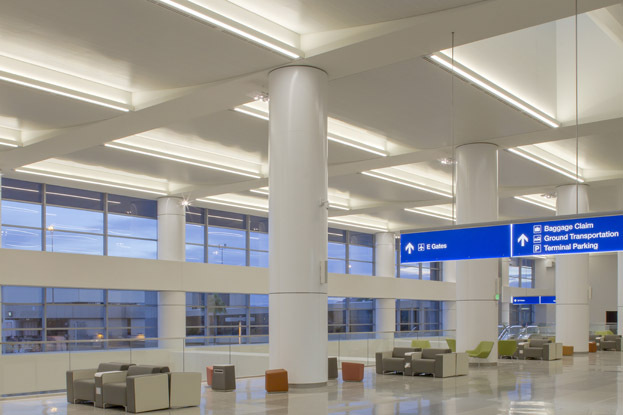 The remodeled space introduced calming natural light to illuminate the high-traffic area by removing dark, stained-glass windows that limited light transmission and visibility. 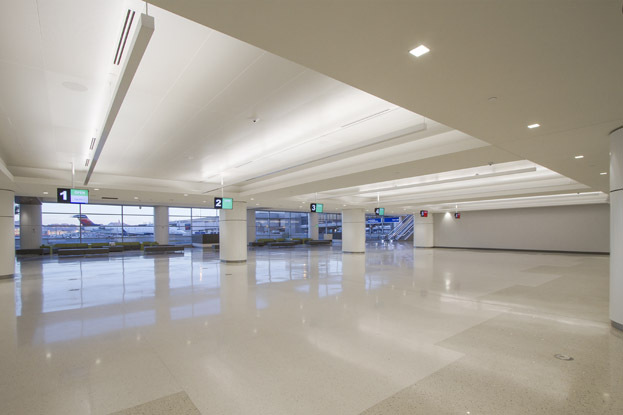 Such a complex project in an active airport terminal required next-level dexterity and coordination. 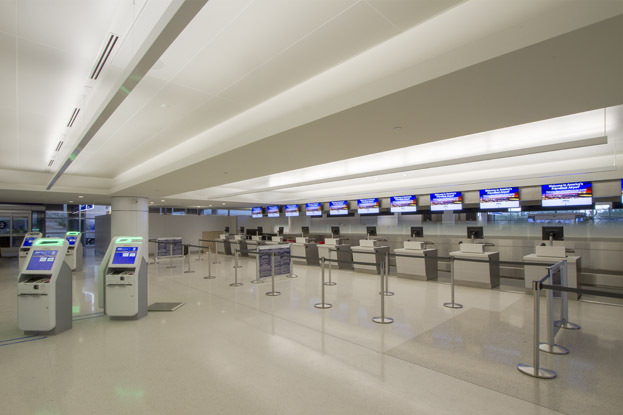 Material delivery had to be scheduled with the least impact on travelers and be escorted by security personnel. 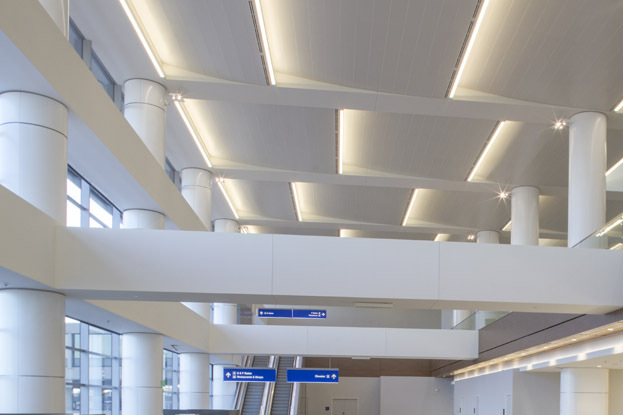 Some of the ceiling sections were even suspended in the air above escalators still in use by passengers. 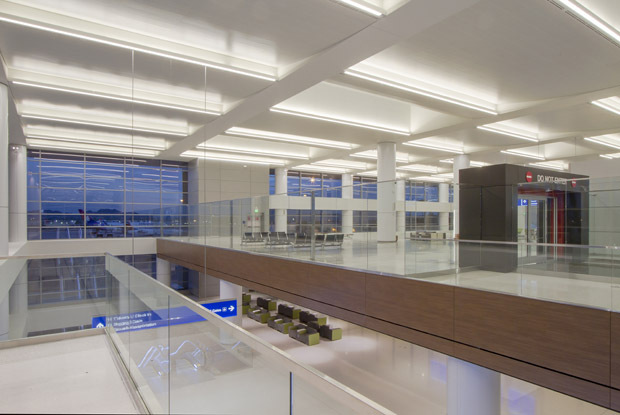 The metal Linear Multi-Box ceilings and soffits use the same wood-look, powder-coat finish and directly integrate into the aesthetics of the exterior building through clear, floor-to-ceiling glass windows. 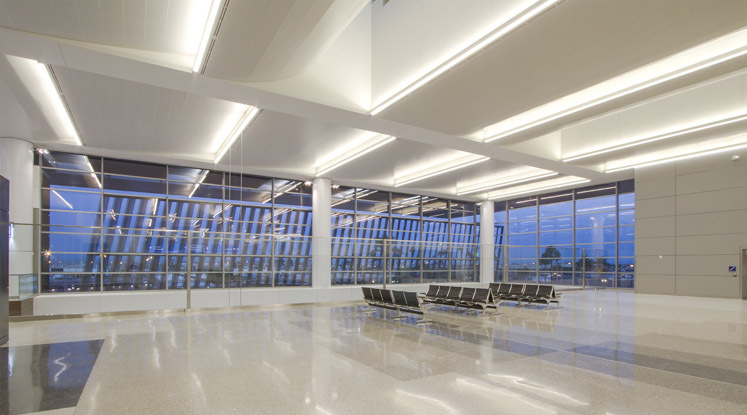 The seamless transition from interior to exterior helps direct travelers to their ultimate destination.